Wholesale Supplier of a wide range of products which include tummy trimmer, contoured ls support, pregnancy back support, lumbo sacral belt, taylor's brace short/long and hernia belt. We have established ourselves as a prominent wholesaler and supplier of Tummy Trimmer that help in reducing calories. This tummy trimmer is well tested on several parameters of quality for ensuring its excellence. Our tummy trimmer is manufactured utilizing the utmost quality material and latest technology at vendor’s hi-tech manufacturing unit. 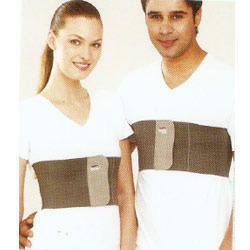 As well, our tummy trimmer is accessible in numerous specifications according to the demand of patrons. We are providing our esteemed clients with excellent quality of Contoured LS Support. The available products are manufactured under the direction of vendor’s professionals using supreme quality material following set standards. These products are high on demand in the market due to its superb functionality. Customers can easily avail these products from us on diverse specifications. 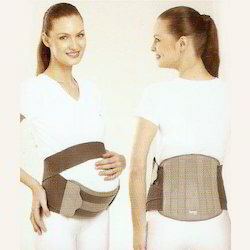 With rich industry experience and knowledge, we are wholesaling and supplying Pregnancy Back Support. This product is checked on numerous parameters in order to supply a defect free range to customers. Our product is manufactured using high quality material and sophisticated technology in fulfillment with the set industry standards. Besides, the offered product is provided within a stipulated time frame with several specifications. 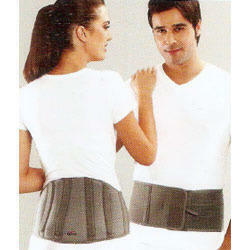 We are a noteworthy wholesaler and supplier of a comprehensive range of Lumbo Sacral Belt. 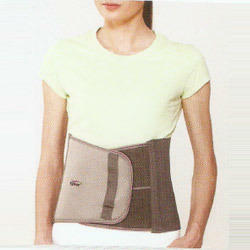 The sacral belt has an ideal back support for general use in mild back ache. 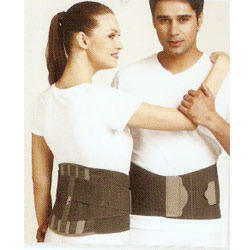 Offered sacral belt is inspected on varied parameters in order to supply a flawless range. 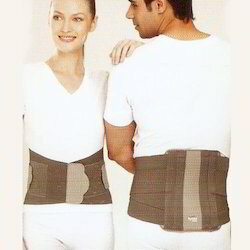 Our vendors manufactured this sacral belt using excellent quality of material & contemporary techniques by vendor’s highly skilled technocrats as per the norms of industry. Rigid, removable, customizable,anatomically contoured, splints ensure perfect fitting, enhanced immobilization & right spinal posture. 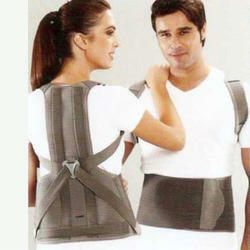 Adjustable shoulder straps, offer neutral spinal posture, strong grip & self tightening of the brace. Sleek, PUF fused body offers good cushioning, better comfort and pleasing aesthetics. Convenient sizing in two heights & two circumferences. & comfortable. 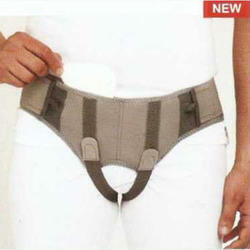 Adjustable pelvic & leg straps, ensure that one size fits a large population & provide customized pressure. Soft and dermophilic with pleasing looks. Can be worn inconspicuously under clothing. Thin construction in single panel,remains inconspicuous through clothes. Strong & porous elastic webbing ensures good compression, improves ventilation and comfort. Broad hook loop tape flapper offers secured holding and size adjustability. Designed in nice shades of grey for pleasingaesthetics. Nylon reeves prevent rolling over of belt. Anatomical design ensures perfectfitting and more comfort. Pre-shaped semi rigid splints ensure a strong immobilization and perfect posture. Monofilament stripped elastic is highly porous & ventilation improves comfort. Its durable and ensures better compression. Double pull elastic mechanism provides extra compression & improves splinting action. Designed aesthetically in shades of grey. Strong elastic with high modulus of 1elasticity ensures better compression &long functional life. Anatomical shape & semi rigid splints ensure perfect posture and effective immobilization. Lean construction, sleek design, pleasing aesthetics, easy to use makes it an ideal back support for general purpose use. Broad hook-loop panel ensures easy application and universal sizing. Strong orthopedic webbing,compresses and holds surgicalincisions during coughing bouts and lleviates pain. Additional Ethafoam pad offers a strong localized grip at the fracture site, improves immobilization and healing. Large hook loop panel allows controlled compression and flexibility in sizing. Extra porous material ensures good ventilation and patient comfort. Thick, anatomic, extra soft, PUF pad grips and binds the fractured sternum comfortably. Strong, V shaped elastic band gives good compression & helps in equidistribution of pressure. Reduces post operative pain and discomfiture, facilitates phlegm expulsion. Bi-tongued hook loop tape ensures controlled compression and easy application. Aesthetically designed in pleasing shades of grey. 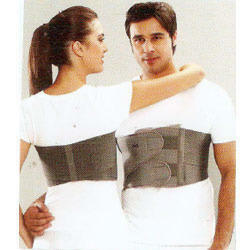 Looking for BOdy Belt & Braces ?